This picture was taken on our way back from Prudhoe Bay, Alaska to Miami, Florida with our Sea Scout group. Driving through Iowa, we stopped for lunch and found this cute little creature collecting grass for its nest. It let us get quite close. 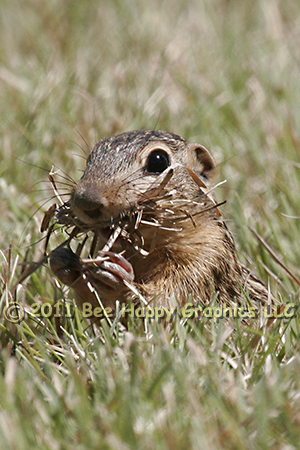 At up to twelve inches long, the thirteen-lined ground squirrel is considered a small ground squirrel. They inhabit an area roughly between the Mississippi River and the Rocky Mountains, from Texas up into Canada. Photographic details: Canon EOS 20D camera w/ EF 100-400mm f/4.5-5.6L IS USM lens set at 400mm. Flash was not used. Camera was on f/10 for 1/800 sec at ISO 400. Fine Art Paper 5" x 31/2" 7" x 5"
Canvas N/A 10" x 8"